This beanie was requested by a friend as a last minute holiday gift for her boss's 13 month old monster. The beanie will probably fit a 1-2 year old, but you can make it bigger by using a larger hook or adding more increase rows after Row 4. You can play with all sorts of color combinations for your own little monster, or even add ear flaps and braided string. The pattern is great for allowing you to add your own creative touches to it. Any worsted weight yarn will work. You may sell the finished product from this pattern, but please reference and link this post. Please don't claim this pattern as your own or sell the pattern. I'd love to see pictures of your finished product! You can post them on Ravelry or on my Facebook Page. The beanie portion, eye, and spikes are worked in a continual round. 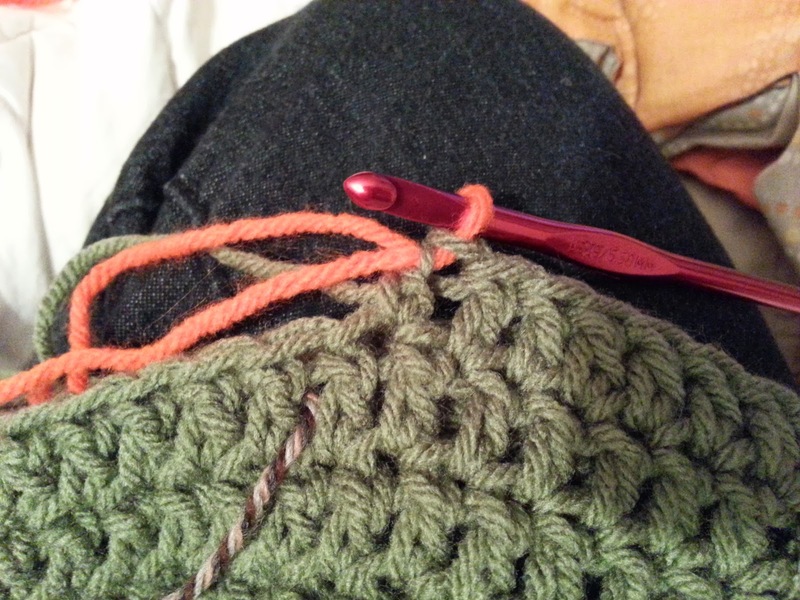 Move the stitch marker up at the end of each round. For the color change, I switched colors as I completed the last stitch in the round (see pictures). 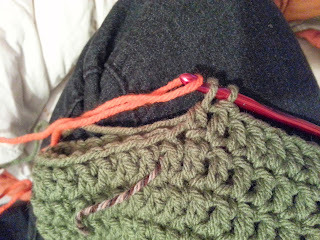 However, you can fasten off and attach the color when finished with the round as well. In green, make 10 dc in a magic circle. Dc in each dc around (50 dc). At the end of Row 11, switch to orange. 1 sc in each dc around (50 sc) Skip 1 st and sl st in next st to join. Fasten off and weave in ends with tapestry needle. In black, make 10 sc in a magic circle. 2 sc in each sc around (20 sc). Switch to orange. *1 sc in next sc. 2 sc in next sc* Repeat from * to *, ending on 2 sc in the last sc (30 sc). Switch to white. *Sc in each of the next 3 sc, 2 sc in next sc* Repeat from * to *, ending on 2 sc in last sc (50 sc). Sc in each st around (50 sc). Skip 1 st and sl st in next st to join. Fasten off leaving a long tail to sew to the beanie. In orange, make 6 sc in a magic circle. Sc in each sc around (13 sc). Skip 1 st and sl st in next st to join. Fasten off leaving a long tail to sew to the beanie. Make 2 more. In white, ch 6. Sl st in second ch from hook. Sc in next ch. Hdc in next ch. Dc in the last 2 ch. Fasten off leaving a long tail to sew on. Weave in the first tail. Use the tapestry needle to sew the eye to front of the beanie. 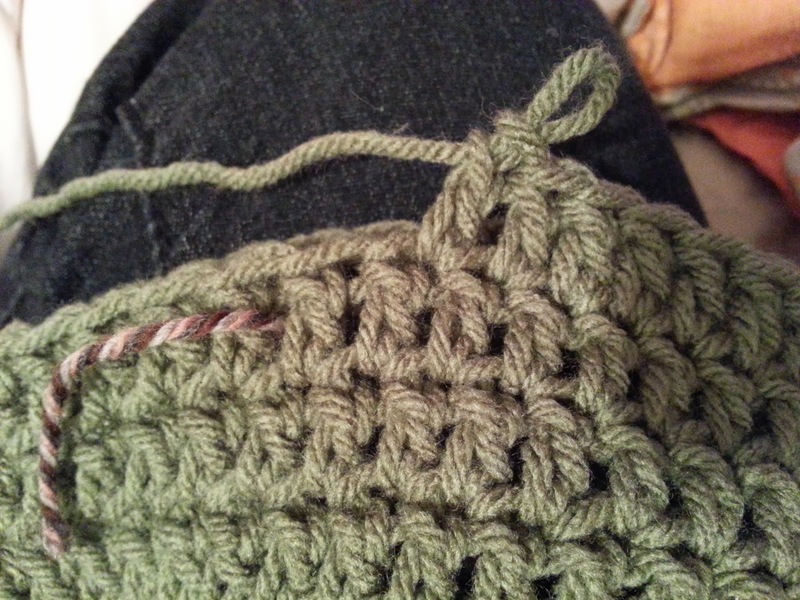 Sew the 3 spikes to the top of the beanie, spreading them out evenly. 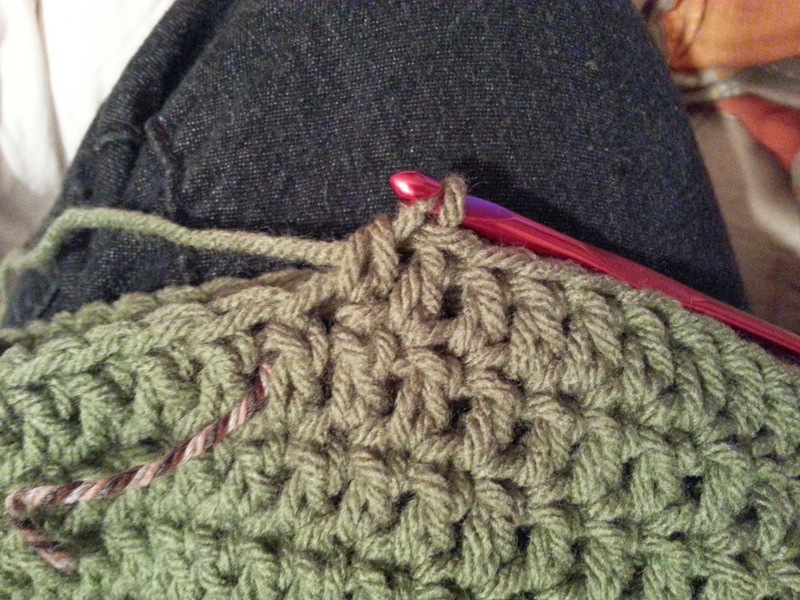 For the mouth, attach the black yarn with a sl st a couple rows below the eye near the brim of the beanie. You can make your mouth as long or short as you like. I chained 26 and then slip stitched on the other end. Be careful not to stretch it across too tightly. Once both ends of the chains are slip stitched to the beanie, shape the mouth the way you would like. Use the tapestry needle and a strand of black yarn to sew on parts of the mouth to the beanie to hold the shape in place. I inserted the tapestry needle in from back to front at one end of the mouth. I skipped a few chains before inserting the needle in again from front to back, then again from back to front, making the shape of the mouth. Sew the tooth below the mouth on either side with the tapestry needle. Weave in all ends. I wish I had a baby to model this for me!